Posted in appetizers, entrees, Fulbright, Middle Eastern, recipe, savory by Antonio Tahhan on December 21st, 2010. You can follow any responses to this entry through the RSS 2.0 feed. You can leave a response, or trackback from your own site. 20 yrs ago I discovered a very good Syrian restaurant in Montréal and they had a delicious sausage on their menu. I wonder if the spices they are using are the same as in your sausage. Sounds really good on pizza. Tony, this sounds and looks lovely. Thanks for sharing with us! We call them Toshka at home. I never knew they were Armenian! And that looks so tasty, I’m so hungry right now. You’re posts are not good for the hungry! Helene, the spices are pretty standard except for the ground fenugreek, which some people choose not to add. Otherwise, it should come pretty close. Hi, A. 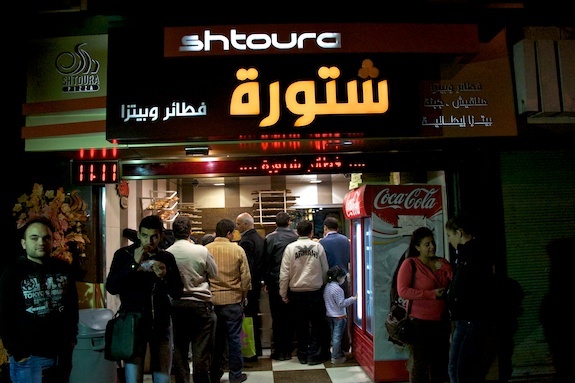 Some places here in Aleppo also call it Toshka, too. 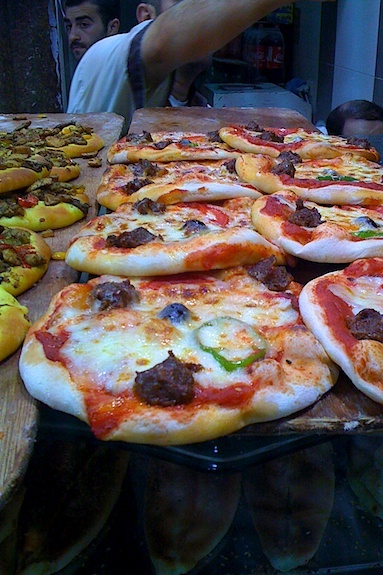 Sujuk has become popular all over the Middle East now. It’s hard to say where exactly the dish came from, but from what I read, it was introduced to Syria (and the Levant in general) by the Armenian community. Kudos for making your sausage from scratch. I have yet to do that. It looks delicious! This is great. Reminds me of نقانق حلبي that my dad makes, except he hates garlic (and by association I do too). Can you post more YouTube videos involving Arabic conversation? I really enjoyed them (food and languages are my weakness). Thanks and good luck with your research. 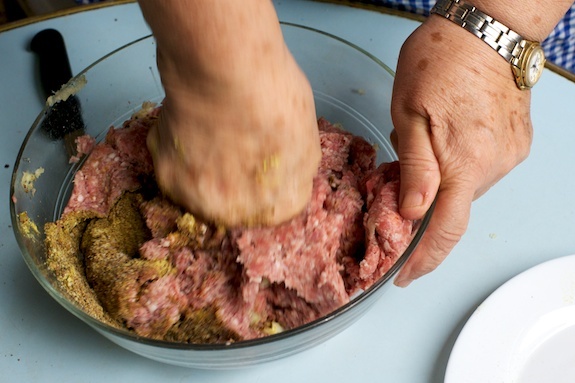 Thanks Tony: my wife loves نقانق حلبي ; it is her all time favorite food, I am concerned with letting the raw meat to dry outside (Health wise and we live next to a park (lots of animal), I am wondering if we dry it in the fridge (not the freezer) will work. Zach: will try to post more videos soon 🙂 I have lots of videos but since I don’t have high-speed internet, it’s not always easy to get them online. I will go to an internet café soon to try and load new videos. Gassan, that’s a legitimate concern. I worry, however, that if you hang your meat in the fridge, your fridge will develop strong aromas from all the garlic and spices. I found this article that talks about hacking your freezer to dry cure sausage — personally, I think it sounds like a lot of work. Thank you for this yummy post. 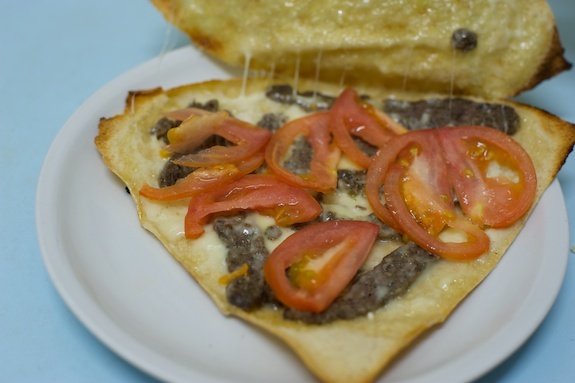 I have just moved to NoVA from Texas and was wondering if you know of turkish/armenian restaurants/grocery stores that would sell authentic basterma and sujuk in or around DC. I have had outstanding basterma a couple of years ago at Jose Andres’ Zaytinya’s. It tasted exactly like what I used to eat as a child at our neighborhood’s armenian restaurant in beirut. Tony, you are a live saver. As a middle-eastern immigrant to the States, I often suffered the lack of availability, or the very high price of Sujuk. I have tried your recipe, and to my surprise, it tasted just like the Sujuk I used to buy in Lebanon, Borj Hammoud, an Armenian town. Now I make for me and share with friends for the price of ground beef and a little effort. You are a live and money saver, and I thank you for that. Thank you Ghassan; sujuk is usually prepared in late fall and throughout winter in Aleppo. Most importantly, the weather should be cool outside to avoid the meat from spoiling. 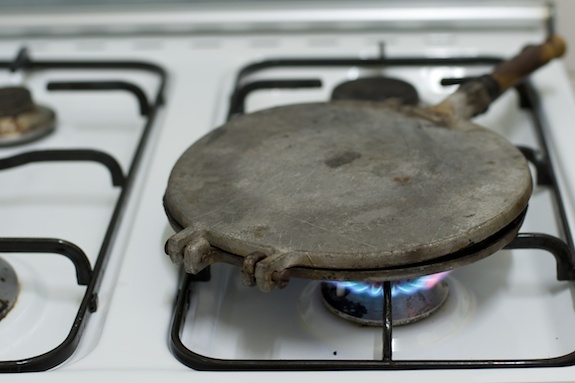 Choose a location that is cool and receives a lot of ventilation (the air/ventilation will help dry the sujuk). 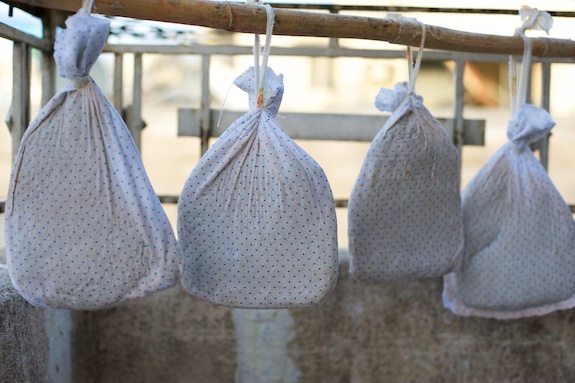 Any porous cloth should work as a bag — a lot of families sew their own “bags” made out of leftover cotton fabric. Make sure that whatever cloth you use is clean and does not have any detergent scent. I hope this helps. Hi Michael, thanks for the comment. 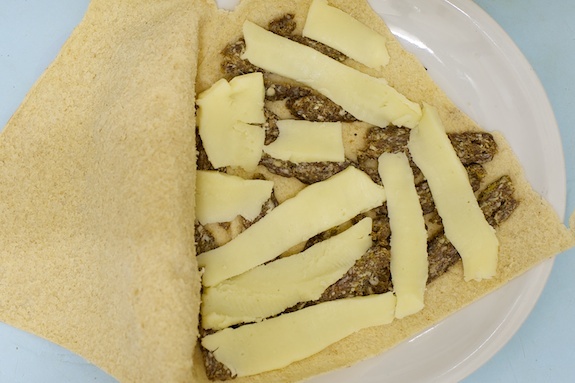 Can you please tell me the name of the restaurant in Saint Louis? I have a friend who lives in MO who I’m sure would love to go there. I have had non-dried sujuk a couple of times. The only problem is that it doesn’t last for long in the refrigerator — a few days top. 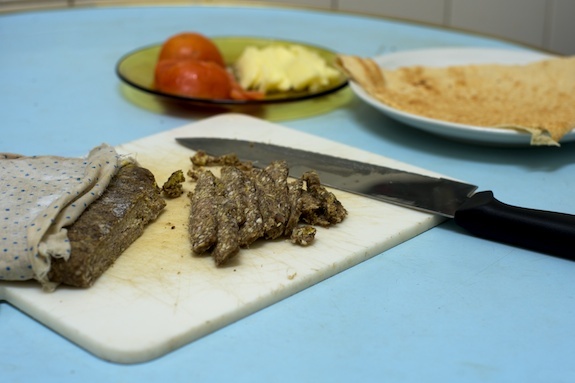 Non-dried sujuk works in a restaurant setting where they can go through a lot before any of it goes bad. 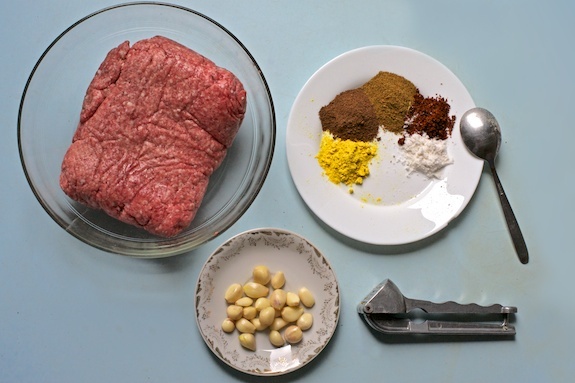 The recipe I posted should also work for non-dried sujuk: I would recommend refrigerating the sujuk for a few hours (preferably overnight), covered, so that the flavor and oils of the spices mix well with the meat. I have not tried dried garlic instead of fresh, but that should work just fine. 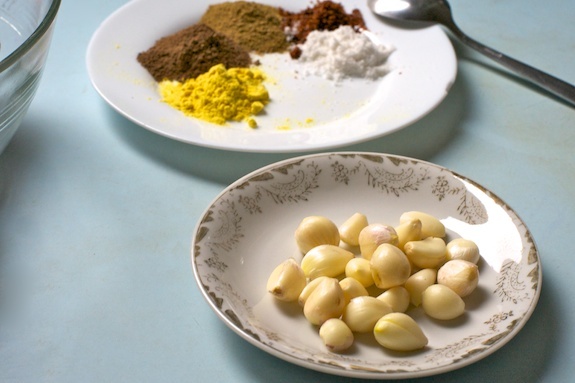 Be sure to use a less dried garlic than you would fresh since the flavor will be concentrated (this is true of all dried spices). Sahten! Hello Tony. I just did a search for sujuk flavoring and looking at the photographs in your blog, took me back home 30 years ago, when my mother did exactly what you show. She even made Basturma and wrapped it, and hung it the same way. As a chef now I have in immense curiosity to understand food and culture as one. So, I have a question. The sujuk I have always had, home-made or store bought, has a little acidity to it. Does it acquire the acidity from the fermentation during drying? Or does it have a minimal amount of some type of acid such as citric acid added. Mind you, I actually like the subtle acidity; I am just curious. I am going to try your recipe and taste it fresh and dry to compare the acidity. Thanks for the recipe and the memories and I am looking forward to your reply. I did not know that feugreek is used in Sujuk ! though I know it is the vital ingredient when you make Basturma. Fenegreek is basic in Egyptian “Sujuk”, especially “Pastrami”, mixed with garlic and paprica and touch of salt. In Pastrami, you add drops of water to form a “paste”, then cover all surface of the raw eye of round beef with about one or two millimeter thick.. as for fear of contamination, in “ALL” cases of eating sujuk or pastrami they shouldn’t be eaten raw in ANY CASE, they have to be well cooked or fried now that lots of bacterial contaminants are to be a concern nowadays, not only that, utensils, hands, cutting boards and anything that comes in toutch with raw meat have to be sterilized, too bad for the fellow who hates the smell of bleach because it’s the best sterilizer along with detergent. I was born in Borj Hammoud, I spoke Armenian for a long time. The best Sujuk ever made by Armenian, but it is of a reddish color. May be the Paprika does it?, but your doesn’t have the same color. Medo I Borj hammoud now is the best. Thanks for posting, i’ll try it. The acidity and red color are from the spice Sumac I think. Thank you, making soujouk from scratch is the only way it tastes right. Store-bought never lives up to it. I am really pleased at how easy and successful it was. One question: has anyone had success with a less-fuzzy cloth? I had to pick a lot of cotton of my soujouk. I know muslin is preferred for bastegh. Perhaps for soujouk as well? @Pete, I agree, homemade is the way to go! I’ve never tried using a muslin bag to cure meats, but that’s not to say it wouldn’t work. The key is to ensure there’s proper ventilation so that the meat can at air dry. If there is no ventilation, you also run the risk of creating an anaerobic environment perfect for botulism. You might also try using a cheesecloth. I haven’t tried this myself, but I don’t see why it wouldn’t work. Thanks for a great recipe! I for one love Sumac, how much would you (or anyone) add to your recipe if you elect to use it? Guys, Sucuk (Sujuk) is originally Turkish. The recipe told here is the Amenian version of it, where Bulgarians, Central Asian people have their own versions. Oh my, that looks so good! Only I’m wondering why you left out the sumac, doesn’t it belong in there? @Nihal: I haven’t heard of adding sumac to sujuk before. A couple people mentioned sumac in the comments, so perhaps it is a regional variety that I haven’t heard of? I know some Armenians like to add ground coriander to their sujuk, too, which I didn’t add to mine. Thanks for sharing! no red wine in the recipe? @Josephine: I don’t add any wine to mine. I seem to recall a Lebanese version that calls for red wine, but I’m not positive. This variation is all about the spices. This seals the meat and cures the meat. I then hung it in the fridge for 10 days. It is now ready to eat, I enjoy putting it in a pita bread or frying it with eggs. Tony…My grandfather, father and uncles who descended from Syria (Aleppo) all made a dried and cured lamb that they called a’deed. My cousin and I are doing a Syrian cookbook of his mother’s recipes and we have a recipe for a’deed but can not find anything that calls it a’deed. I was wondering if you have reference to the term a’deed. Cut meat into 4–5 pieces. Generously season with salt on each side. Put in a bowl with a paper towel on bottom to absorb moisture which will form. Cover and leave in the refrigerator overnight. The next day, string each piece of meat and hang outside on a pole somewhere safe from pests for 1–3 days until the meat starts to feel dry (firm) to the touch. Peel the garlic and crush. Mix together with the rest of the ingredients. Add more water if needed to make a paste and coat the meat with the paste. Put the meat back outside for 2–3 days to cure. Hi Tony, thank you for posting recipe of Armenian Sausages from scratch. I’m from an Egyptian background but grew up in Africa. There were lots of Aremians that live there where they were escaping from all the unhumantarian conducts that they encountered. Accordingly and luckily for us, they introduced lots of their authentic delicacies such as Sujuk, Basterma, Mortadella, Feta Cheese, Hard Romanian Cheese, Braided Mozzerela Cheese, etc. Sujuk in particular was a kind of little sausages stuffed in lamb casings, and they had no garlic or feungreek. 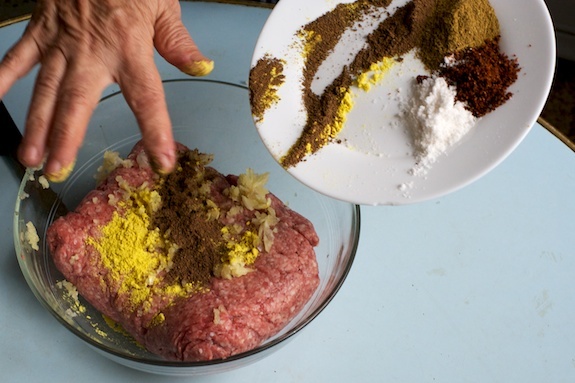 Other than that it contains all the other spices such as nutmeg, allspice, cloves, vinegar, and some add bread crumbs to the meat to tenderize the bite. What I noticed Tony, some of the original receipes get shifted around according to the ingrediants that are available in the regions and to the liking of the locals. Having said that Sujuk remains an Armenian dish and everyone should keep this name so we learn about the origin of different dishes.